Abu Dhabi is the capital of the United Arab Emirates. As modern and wealthy as any of the neighboring Emirates it does offer the visitor fascinating glimpses of the Gulf culture as it exists today. This tour includes luxury hotels,which aim to spoil the visitor. You will gain a good overview of this fascinating city, where tradition and hyper modernity meet. 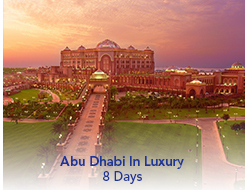 Arrive to Abu Dhabi, United Arab Emirates, where you are met and escorted to your hotel. The remainder of the day is at leisure. An urban sanctuary in the heart of the capital, majestically set on the waterfront, Eastern Mangroves Hotel & Spa by Anantara is a natural haven on the cusp of urban life. Forming part of an integrated hotel, marina, retail and residential destination, its unique location offers guests an exceptional Abu Dhabi experience. The exotic beauty of the region's precious mangroves provides the perfect backdrop for the rich cultural traditions embodied in the hotels impressive architecture. Discover luxury accommodation definitive of urban Emirati life, yet filled with natural charm at Eastern Mangroves by Anantara.